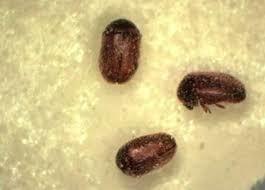 These pests got the name from the fact that they infest tobacco products. They are found all over the world. Cigarette beetle adults are about 2-3 mm long and brown in color. Females lay white colored eggs and adults will fly to reach food and breeding areas. The cigarette beetle will infest such things as: coffee beans, cigarettes, pet food, paprika, and spices just to name a few. If discovered, all food or infested items should be discarded. Remaining food items should be placed in sealed containers. Grocery stores where products were purchased should be notified.